Is Having Online Booking Effective for Businesses? As a business owner, you don’t want to waste your time and funds implementing practices that won’t be effective. Additionally, if something seems too complicated or time-consuming to use, it’s very likely to be skipped as well. New technologies often face this type of resistance, even though they might be reasonably easy to set up and use. Whether you have a dedicated receptionist or not, some staff member will have to tackle appointments. That essentially ties them up to the task of working the phone at best, and at worst it divides their attention between duties, which can negatively impact their productivity. On the other hand, online booking will free up your employees to focus on what they do best, without having to spend a lot of time communicating with the customers over the phone. That can increase the overall productivity and efficiency of your practice while still keeping customers happy. Depending on the online booking system you opt for, you can access valuable data about the services you offer. For example, you can find out what the most requested service is. Or which one is the busiest appointment time slot. Knowing what your customers are interested in the most can help you refine your offer further and provide them with more of what they want. Furthermore, the online booking process provides an excellent opportunity to upsell by showing the customer an extra offer that they might have interest. Coupled with the valuable data you obtain. Your online booking system could provide you a significant marketing edge over your competition. Online booking is widely regarded as a system that makes it easier for the customer to schedule an appointment in the time frame when they can certainly make it. As customers become more likely to show up, that reduces no-shows, which can benefit your business significantly. You won’t have any more wasted time slots that could have been taken by other customers. Additionally, online booking reduces errors in appointment scheduling, both from the customer or employee. Ready to Make Your Business More Effective? In the effort to build a profitable business, even the smallest push towards increased effectiveness helps. We understand what it takes, which is why we’ve developed a tool that is sure to help. 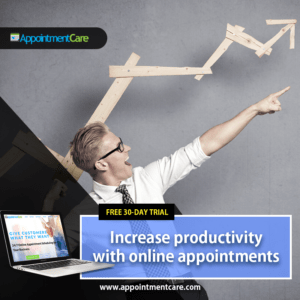 At Appointment Care, our scheduling software can help you take full advantage of the capabilities of automation to aid your efforts in making your business operate more effectively. Start your free trial, and grow your business by utilizing online booking that will let you focus on doing what you do best.